A VOLUNTEERING award has been presented for the very first time to some of those who give their time in support of NHS Dumfries and Galloway. 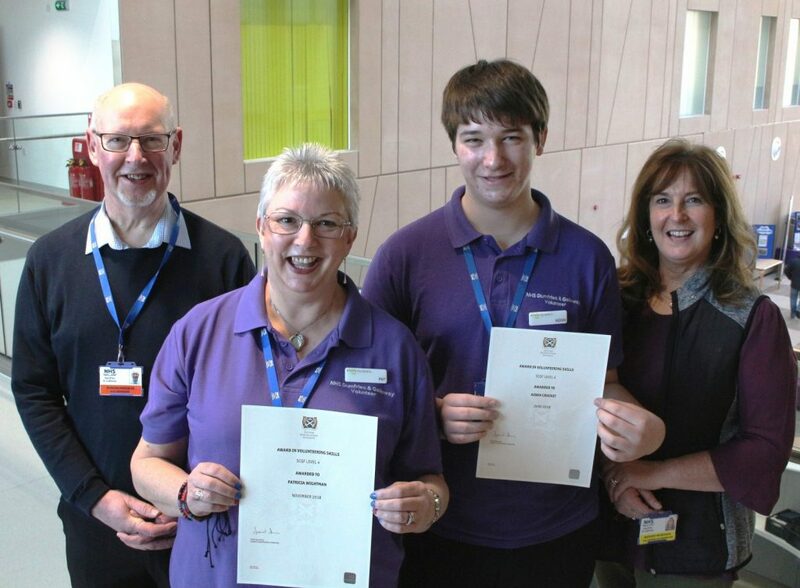 Pat Wightman and Aidan Crocket were the very first local NHS volunteers to be presented with the SQA Award in Volunteering Skills through a pilot training programme. Margaret McGroggan is Volunteer Co-ordinator for NHS Dumfries and Galloway, and she said: “I’m really pleased to see our first two volunteers being presented with their SQA Award in Volunteering Skills. “The whole idea behind this award was about its ability to help build confidence among the volunteers, and seeing them recognised for what they’re already putting into practice. Local training consultant Duncan Harkness was brought on board by the NHS’ Organisational Development and Learning Facilitator Alison McConnachie to help Pat and Aidan work towards their award. Duncan’s association with NHS Dumfries and Galloway dates back about 18 years. He said: “I started off initially doing Modern Apprentice programmes, and then I got the opportunity through Margaret to look at the SQA Volunteering Award. Pat and Aidan’s work towards achieving the SQA involved workbooks, and conversations with Duncan. Aiden says he gained a lot from pursuing the award. He said: “It’s allowed me to build my confidence. I tended to stay in the corner at school, but I’ve become involved with the NHS and Blood Bikes and have progressed from there. Meanwhile, Pat said: “It’s just something I’ve always wanted to do. I’ve always wanted to do volunteering, and I’ve always been interested in it, but doing the training just gives you a boost and more confidence about what you’re doing. “It shows you the opportunities of what you can do around volunteering, and you’re more aware of how important volunteering is.